Industrial Tool & Die is happy to announce that its facility expansion project successfully completed at the end of 2009. The addition, added to the rear of the building, adds 5,000 square feet of space to the existing 12,000 square foot building, giving us a total of 17,000 square feet of modern manufacturing space. The rear addition is being used primarily for the production department, but also allowed Industrial Tool & Die to take space previously used for production and reconfigure it to be used by the CNC department. Industrial Tool & Die's goal is to provide the best customer service and finest precision manufactured parts through cutting edge technology, and this facility expansion allows us to do just that. Please take a look at our machining and stamping pages to see our expanded capabilities. We have increased our manufacturing capacity to better service our customers needs. Recently added to our shop floor are 2 new Vertical Machining Centers, 2 Wire EDM's, and 1 CNC Sinker EDM. Our latest VMC, a Fadal 6030, has increased our machining envelope to 60" x 30" x 30", also equipped with through spindle coolant for increased cutting speeds which will aid in reducing delivery time and improved surface finish. Our 2nd new VMC, which was added earlier this year, is an additional 3016 for faster turn around on production runs. This machine's twin was introduced to our shop floor 2 years ago. Our EDM department has also expanded. In early 2004 we purchased and installed a Sodick AP500 Wire EDM, this machine has a work envelope of 20" x 14" x 11" and is capable of cutting as small as .001" corner radius. This machine is also equipped with an extra fine finishing package. This feature enables us to EDM micro finishes without polishing. 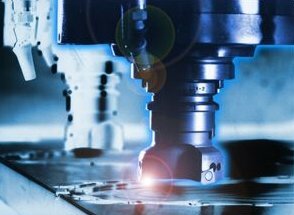 Our goal is to stay on top of the cutting edge technology so we may reduce turnaround and improve our service of providing precision manufactured parts for our customers.